I love Software Saturdays. But this find didn't come from me. Even though I was in the same region trying to get the new version of M-Blog to work, I didn't even come across the DJ Mixer Application. 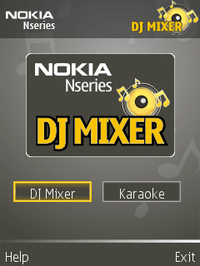 According to a tip (thanks Anthony) and a search result that landed me on Symbian-Freak, I found that Nokia Nseries in India has this cool app available for their Music Edition Nseries devices called DJ Mixer. 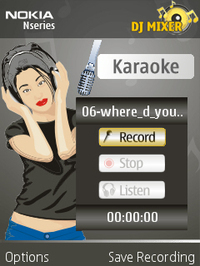 DJ Mixer has 2 functions, mixer and karaoke. 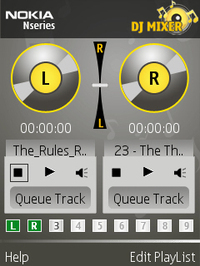 With DJ Mixer you can create your own playlists or load an existing playlist from within the the music files on your device. The only problem that I found with this is that it will only add MP3's that you have stored. 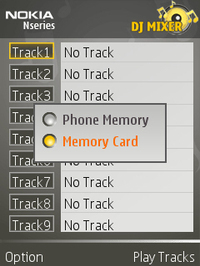 If you've converted your music to AAC format using Nokia's Music Manager you won't be able to find your music. 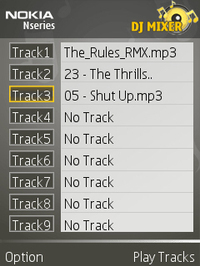 Once your playlist is created you can listen to the playlist and mix the styles as you like. Lol, I'm not a DJ so I have no styles! The Karaoke function seems fun!! Now I'm not gonna play my mix because my voice sounds like crizzap!! 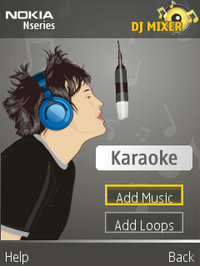 You can load your own MP3 from your device and record and save your own karaoke tune. Unfortunately I got a java error when trying to listen to what I recorded... maybe that was a way of saving me from myself, lol. All in all the app seems kind of fun, and paired with some stereo bluetooth headsets you could really have some fun. Visit NseriesIndia for more info, but the download on the site is only for consumers in that region. On the site it states that Nseries DJ Mixer is available for the N70ME, N91 and N73ME but I've been playing with it on my N95. Where can I download the Nokia N91 version? Think this is only for india. But I will appreciate if somebody can download the N91 /3250 version as well. @Frankie... the download link is above!! I have a Nokia N91, my wife a 3250. And I keep trying and trying and seems to be that the India site doesnt send any link to download the N91 version. Try that and didnt work. Try that and this version is only for QVGA Screens: N93, N73, N95. Hey I have Nokia N73ME and i'm unable to download the application of DJ Mixer.Can anybody tell how to download this software to my mobile??? how do i put the software on to my phone after downloading it? Am unable to download this from the zip file link you have given. it says unable to extract. Can you please mail me the same.....? Use Nokia's PC Suite to install the application to your device. Darla, any luck i can get the nseries dj mixer for N91 froom you. Been trying to download from anywhere but to no vail failed.